BENEFITS: Increases flexibility of the spine. Tones and strengthens the abdominal and back muscles. CONTRAINDICATIONS: If you have weak wrists or carpal tunnel syndrome, you might like to rest your forearms on some cushions or a low chair. As with all poses of the week – if something doesn’t feel comfortable – don’t do it. PRACTICE: Be on all fours making sure that the knees are directly underneath the hips and the hands are underneath the shoulders…. Spread the fingers wide with the thumbs reaching in towards each other. Take a moment to bring awareness to your breathing… The next time you breathe out imagine you are bringing your navel towards your spine and arch up. Then when you breathe in allow the belly to drop creating a downward arch. Be aware of keeping space at the back of the neck and not lifting the head too high. Carry on arching up on the out breath and arching down on the in breath as long as it feels good for you to do…Finish on an upward arch breathing out…. BENEFITS: Lengthens the spine – especially in the lower back. Can help ease lower back ache. Helps to open the front of the shoulders. Tones the abdominal muscles. Very relaxing and can relieve stress. 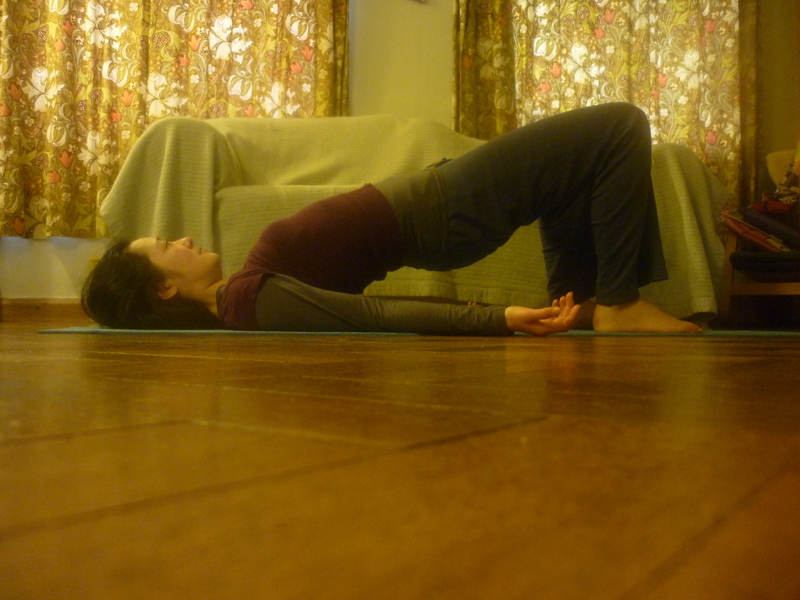 PRACTICE: Lying on your back, gently hug the knees towards you. This will give you a nice long spine. On an exhalation emphasize your footprints – This will lighten the pelvis and bring the back of your waist to the floor. When you breathe in – relax everything. The next time you breathe out, push your feet into the ground a little more so that your pelvis begins to rise up with some of the lower spine. When you breathe in, come down vertebra, by vertebra until the pelvis is back down on the floor again and relax completely. Carry on with these movements of pushing the feet into the ground as you breathe out and releasing everything as you breathe in. To get even more space in the lower spine visualize the tailbone being pulled away as your pelvis rises up. Keep this image of the tailbone being pulled away as the hips come down as well. Students and other yoga teacher’s often ask me about my personal practice – How often and for how long? Time allowing, I will also do a twist – usually lying down and a side bend. Which means that at the very least I have done the 6 movements of the spine (forward, back, rotation to both sides and side bend – both sides) every day. I will also do a wheel from lying 2 or 3 times – in the most relaxed way possible. Because I don’t want to wobble when I teach a balance during a class, I also try to do tree, warrior 3, half moon and some variations of uttitha hasta padangusthanasana most days. Yoga is close to my heart though and with me for much of the day. If I’m ever still for a period of time, I need to move and stretch and I will… If I see a bar to hang from – I usually do. During the day, I will forward bend at least twice.